Every long distance cyclist swears by the by the equipment he or she is using, and generally the gear is as varied as characters on the road. There is no right or wrong bicycle for touring; it comes down to assessing your needs and deciding which bike is adequate. Lightweight speed bikes are good for those looking to make good time with minimal baggage on smooth roads (credit-card cyclists). For those travelling at a more relaxing pace and wishing to be self sustained, a good quality hybrid or mountain bike should be adequate. Your local bike shop can help with optimizing the geometry of your bike for maximum comfort. Whichever bike you choose, make sure it has the necessary mounts for in pannier racks. If you plan on loading your bikes heavily, or are venturing on an extended expedition, be sure to use DT spokes in your wheels. DT spokes are the best on the market, and the slight extra cost by far outweighs the grief of continually breaking spokes. Which Companies make Good Bikes? Generally the only thing unique with various bicycle brands is the frame. The components, wheels, spokes, etc are made by third-party companies and are fairly consistent within the industry. You can find a bike decked with your favourite components made by any company, so it all comes down to the differences in frame. Frames do sometimes snap in the field due to the increased stresses of carrying heavy loads, so it is worth considering carefully. Norco bicycles of Canada has a reputation for making extremely strong frames and on our recent journey around the world, the frames held out through the roughest conditions. In the past I have broken two mountain bike frames – a Raleigh and a Rocky Mountain – while light commuting in the city. Mountain bikes are generally more robust in order to cope with the rigours of trail riding. If your planned route includes rough terrain or badly-maintained roads a mountain bike is probably a good choice. Additionally, a mountain bike allows for side excursions on mountain or forest trails. It is highly advisable to trade the knobby tires for slicks, for vastly improved performance on roads. Full-suspension mountain bikes are not recommended for long-distance touring unless most of the trip is on rough trails. Hybrid bicycles are a cross between road bikes and mountain bikes. Some are closer to road bikes with lightweight frames and 700C- size wheels, while others are closer to mountain bikes with smaller wheels, heavier frames and fatter tires. Many hybrids are good for touring, and the variability allows one to find a bike ideally suited for his specific needs. For those looking to travel fast speedy road bikes can be used. Road bicycles have narrow skinny 700C tires, lightweight frames and usually dropped handlebars. They should only be used on smooth surfaces and loading weight should be kept to a minimum. Heavy loading reduces the speed advantages of a performance bike and more importantly, increases the chances of equipment failure. Packing light usually means not being self-sufficient; and instead hotels and restaurants are utilized en route. Norco produces a fairly unique design of road bike, the VFR line, which is ideally suited for light-weight touring. The VFR series bikes are lightweight and fast, but some modifications have been made for increased comfort. We used these bicycles on our 8300 km bike ride from Costa Rica to Canada with good results. Be sure to use DT spokes on your bicycle. Cheap spokes have a tendency to start breaking (especially with heavy loads). 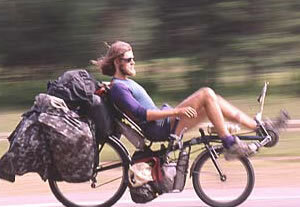 Recumbent bicycles can be used for long distance touring. Recumbent enthusiasts claim that the comfortable seating is akin to sitting in a movie theatre with an Imax screen, and your head is better positioned to comfortably absorb the scenery. Additionally, with their lower profile, they are well suited for pedaling into headwinds. The drawbacks to recumbent bicycles are they are more difficult to push due to their low structure, and they are not as easy to ride in rough, muddy or slippery conditions.